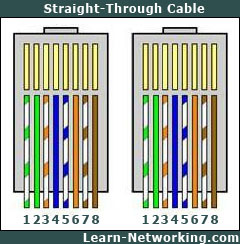 There are generally three main types of networking cables: straight-through, crossover, and rollover cables. Each cable type has a distinct use, and should not be used in place of another. So how do you know which cable to use for what you need? Notice how each wire corresponds to the same pin. This kind of wiring diagram is part of the 568A standard. The 568B standard achieves the same thing, but through different wiring. It is generally accepted to use the 568A standard as pictured, since it allows compatibility with certain telephone hardware- while 568B doesn’t. While the rule of thumb is to use crossover cables with like devices, some devices do not follow standards. Others provide support for both types of cables. However, there is still something that both crossover and straight-through cables can’t do.